A simple partnership dissolution agreement, professionally drawn as a framework for the partners to dissolve their partnership. Covering practical, commercial and administrative points, it can be used for partnerships of any size and in any industry. This is a professionally drawn, simple partnership dissolution agreement designed to give you the legal and commercial framework you need for tying up the most important of the “loose ends” when you go your separate ways. The agreement covers points such as what each partner will “buy” out of the business, who (if anyone) takes over the business, and how debts and assets will be divided. This document can be used to record the final agreement, but it also makes a good “discussion document” for your talks about separation. Partnership dissolutions can be stressful and time consuming. This agreement will enable you first to identify, then to deal simply and quickly with the main issues. 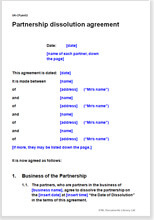 This agreement is ideal for small partnerships (less than ten partners) but can be used for larger ones as well. It can be used for businesses in any industry, from accounting to architecture to trades.